Eavesdroppers, it’s said, never hear any good of themselves. As it happened, I wasn’t eavesdropping but I was sat in close proximity to a conversation that I couldn’t help overhearing. It was at a higher education establishment and a department member was explaining to a colleague how to get something in the local paper. 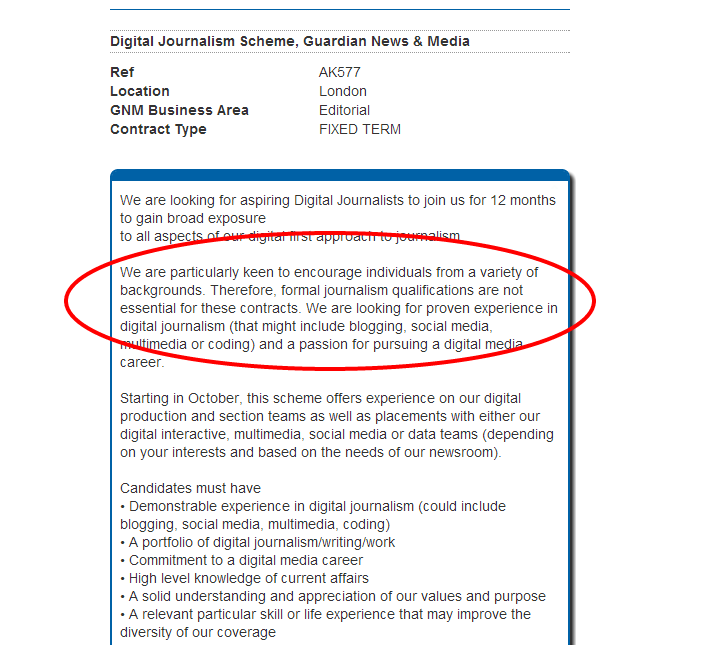 While I cringed to hear the job so casually dismissed, a part of me also wondered why several thousand pounds a year needed to be charged to turn base metal students into journalist made of solid gold if “anyone could do it”. Look at that – a wind of change just blew right by me. The interesting thing about this ad is that while you must have a commitment to a career in digital media and a high level of current affairs knowledge, you don’t need your Law, or your Newspaper Practice, for 100wmp shorthand. In fact, the word ‘degree’ doesn’t appear on the page. Ok, the job is for a year and there’s no guarantee of any permanent work at the end of that time, but it does show how the industry is trying to shift towards new paradigms of resource and culture, and that the accepted recruitment requirements for the new world are very different. Newsrooms are evolving; even in the ambling world of print media there’s an understanding that, to borrow a phrase from Terry Pratchett, ‘old gods do new jobs’. If you’re a reporter, your role in gathering and creatingcontent is vital, but how that content is used, displayed and packaged – social, mobile, desktop, print – is changing all the time and working out how to serve print and digital masters well and fairly is a constant pressure. A new website or an e-edition, or a vibrant social media presence, have value to an audience only as long as the content is unique and compelling. Shovelware won’t cut it, rss-pumped links won’t and neither will writing the same story to different lengths or (personal bugbear) putting a few pars on line with a x-ref to the next day’s paper. In print newsrooms there are new niches that exist even if we aren’t aware of them or haven’t considered what they mean yet. Community management is a mostly-acknowledged necessity these days, but what about live management, and the importance it plays across all platforms? Knowing where your readers are at any given point int he day, why they’re there at that point, what brought them/what kept them, for how long, and where they went afterwards – these are key questions we need to know. And when they come calling, they expect to find good content. So niche roles that we didn’t realise needed to exist two or three years ago are now glaringly apparent. Roles like the ability to convey, clearly and accurately, real time information in a conversational way, to package web content in a way that adds value, and doesn’t game page views, to appreciate SEO and live audience statistics, and to understand how these ebb and flow in response to user demand on the website or mobile site, or to run an informative and accessible live blog that doesn’t just turn into a slew of imported tweets from other streams. Every newsroom needs these things, like they need a health reporter, or a night editor. These aren’t roles that we can manage without, and that’s without getting into the need for even basic data journalism, an excellent grasp of social media, and some audio/video capabilities. A plumber would have to probably face training courses and a set of exams before being abe offer new services; in the resource-controlled world of newspaper publishing, retraining and acquiring new skills needs to happen on the job. What also needs to exist is an environment that allows that, and in a time-pressured newsroom, that may be the most precious resource of all.